You can find a working Netflix Subtitle Downloader 0.13.22 here (The first mega link). I will keep updating the Kodi add-on as long as i can. Alan,do you know how to download subtitle from fox+? can you create a plugin to get Videos too? Hi Alan, Netflix – subtitle downloader now supports downloading the subtitles in WebVTT format, thanks to “Tithen-Firion”. That’s awesome, good to see all these new developments. I think this add-on could be modified too for downloading the subtitles from Firefox in WebVTT format for all the languages. And here is a modified version of the add-on to download the subtitles in WebVTT format for all the languages using Firefox, install it manually by opening Firefox and from “Tools” menu choose “Add-ons” then press on the settings icon and choose “Install Add-on From File”, choose the add-on file “netflix_1080p-1.7-fx.xpi” and press on “Open”, the steps of downloading the subtitles are much similar to the steps in google chrome. 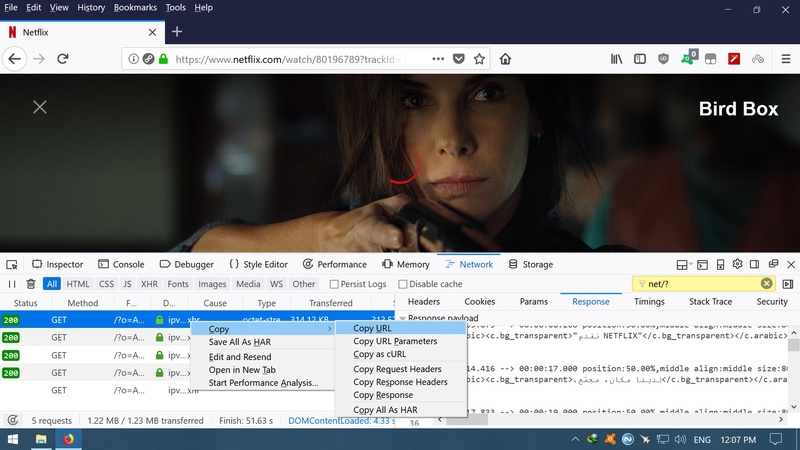 You can modify the file by renaming it to “netflix_1080p-1.7-fx.zip” and extract it, after modifying the add-on file delete “META-INF”, and submit a new add-on to Firefox. I mean to submit a new add-on with a new name like “Netflix Subtitles Downloader” and a new version to your account in the Firefox site here, zip the files and upload the add-on file. And here is a photo for downloading the Arabic subtitle for the movie “Bird Box” from Netflix using Firefox in WebVTT format (you could use net/? instead of net/?o= for the searching). The problem for me is that if I enable Japanese subtitles, the plugin seems to fail, and I see some error messages in the console. I don’t get the errors when I have English subtitles enabled. But my first thought, is perhaps it is possible to use this plugin to enable the text subtitles, and then use https://greasyfork.org/en/scripts/26654-netflix-subtitle-downloader to download them easily? While i was searching Firefox extensions today, I found that someone already managed to make an extension for downloading the subtitles in SRT format for all the languages using Firefox , and he made a version for Google chrome too, and here are the add-ons, i tested them and they worked great, i tested them with Arabic, Japanese and Korean subtitles, just play the videos and in the upper right you will see buttons for choosing the languages and for downloading the subtitles in SRT format (the add-ons is using webvtt-lssdh-ios8). To see the add-on files rename this file to zip and extract it. If he continues development on this, I will probably stop updating the kodi plugin in the future, since it might be obsolete now. Please do not stop updating the Kodi plugin, the Kodi plugin gives you much more options for modifying the add-on and you can download the subtitles for many languages at the same time with it and you can download a whole TV show season in few steps using the auto-hotkey script and i almost sure that it can be modified to download the whole season of TV series without using the auto-hotkey script, beside having more than one way for downloading the subtitles is always a good thing. Well, we’ll see. It’s possible that the browser extension may be updated with new features in the future. But I will definitely have less motivation now, as the extension basically does exactly what I wanted from the very beginning. Hi , ALAN. Seriously thank you for everything. is there anyway to get the japanese subtitles or other languages such as Arabic, Chinese directly from Chrome browser , in srt format ? save the file, open google chrome, from the menu choose “More tools”, then “Extensions”, and enable “Developer mode”, press on “load unpacked” and select the folder of the unzipped and modified “netflix-1080p-1.12”, before all of that you must make sure that Netflix is playing the subtitles in the language you need to download the subtitles for as default, for me its Arabic, go to Netflix and press on “F12” and choose “Network”, in “Filter” search for “net/?o=”, then play the movie or the TV episode (the video will not play, do not care), and under “Name” right click on the subtitle link and choose “Copy”, then “Copy link address” and download the link with “IDM”, or just open it in a new page and download it, and rename the extension of the file to “vtt”, then use “Subtitle Editor” to convert the file to SRT. You may try to modify the files so this method be much easier and to download the subtitles in SRT format directly. Thanks, I’ll take a look at this over the next few days. Thank you, and i think finally you might need to publish the modified extension in google chrome store, and to give it a new name and a new version something like this one, and i think it’s better to be unlisted. And here are photos for the steps. worked.but output “Subtitle_urls is empty”！ I don’t know which part didn’t work. What operating system? Did you go in the settings and specify a folder to download to? Did you specify a language code in the settings? If you set a language code, try removing it.